This house is just too cute! BEFORE: Beaten up and showing her age. AFTER: Cleaned up and restored to original colors. When we sanded the red and some of the white off that the customer had painted on as a child we discovered the original colors underneath! When we mentioned it to the customer she did recall the green trims and light green steps so she opted to have them repainted back to whatever we found under the white and red. removed and replaced with real wood floors. The bottom checkered floor was to be cleaned. But even after cleaning, the red/cream flooring was still looking dingy and old. So we discussed options with the customer and she opted for wood flooring in that lower left room too. The lower right room (dining room) was only getting a floor replacement at first. But then customer decided she wanted that room to look more elegant so per her request we added white trims to that room. I think it really added a fresh and crisp look to that room. Such a simple fix completely changed the look of the room! BEFORE: White paint drips on the foundation. AFTER: Matched the back ground paint color to blend the spot. I hope you enjoyed the World War II British P.O.W. 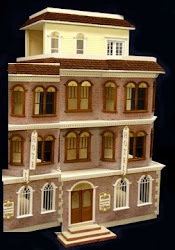 dollhouse as much as I did! 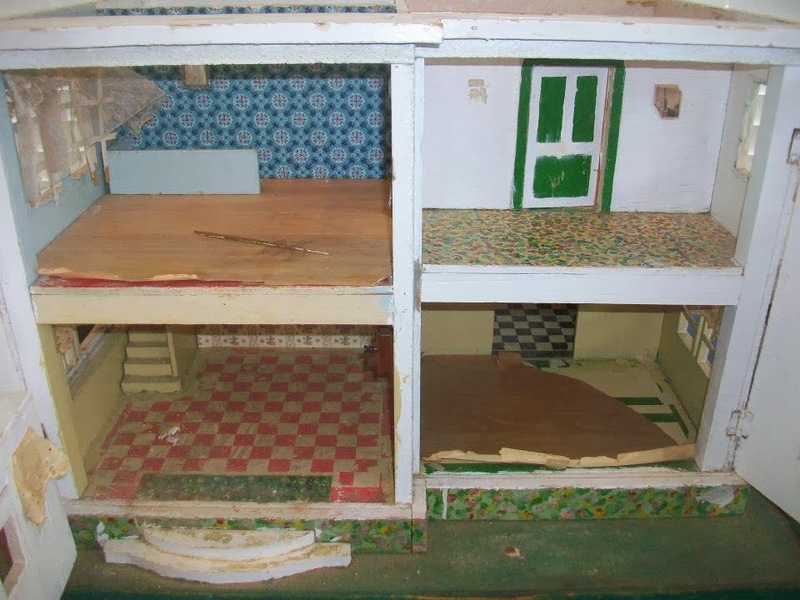 The WWII POW dollhouse is finished! What a difference! I have to admit I went a bit overboard. Customer wanted to focus on fixing up the house and since the roof was passable she did not want us to fuss with it too much. We were only hired to repair a corner or two and maybe finish off the trim. 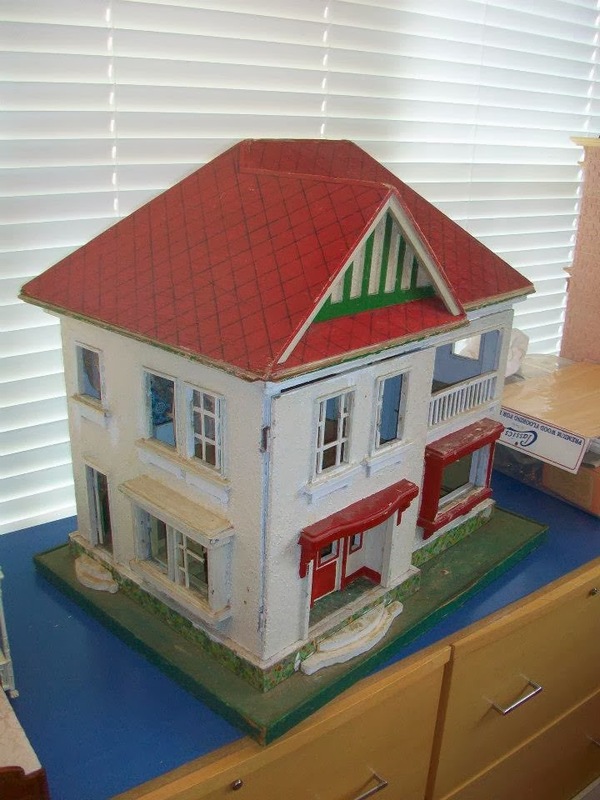 But I went ahead and did some extra on the roof to help it blend in better with the overall "fix up" of the house. 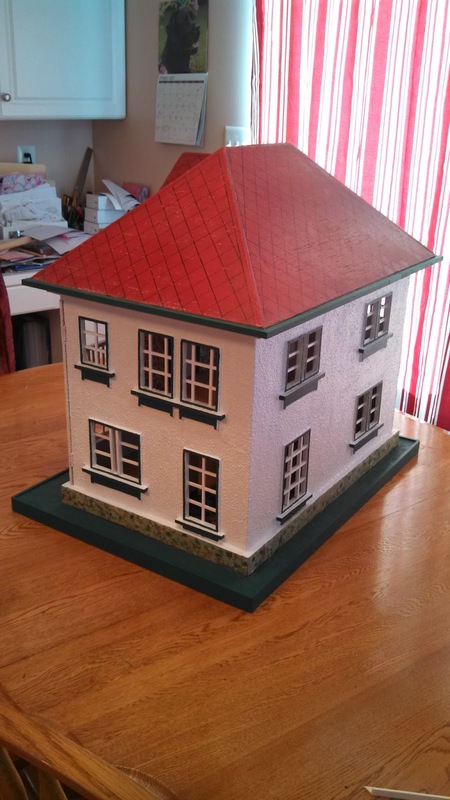 I matched the paint color and painted over the bare spots on all the roof edges at the top. I think it looks a bit fresher this way . . . .
BEFORE: Corner where roof peak met. AFTER: Rough spots still there, but all is painted. BEFORE: Raw wood exposed all down the peak of the roof. AFTER: Painted along the ridge cap to match. Overall I think the roof blends nicely with the upgrades/work that was done for the entire house! AFTER: Still shows her age, but a little "facelift"
put the roof on par with the sprucing up the house got. 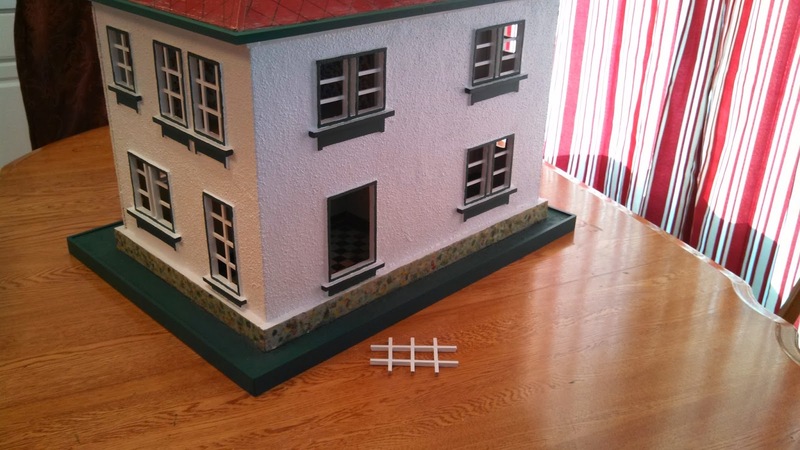 An added touch: Customer recalled that the lower back two rooms were next to impossible to access as a child (probably how the mullions in the windows became broken was from hands trying to shove pieces in those rooms). The one is accessible by the side door (a narrow opening, but still feasible for getting small bits of furniture or accessories into the room). 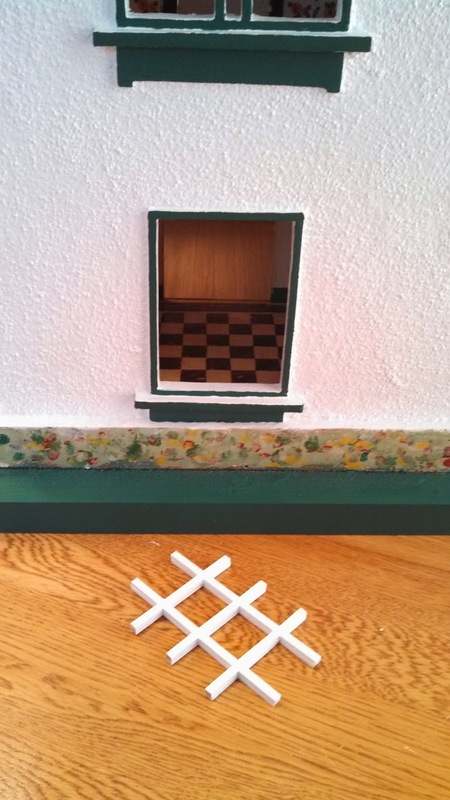 And the black/white checkered floor room (designated a kitchen) was only accessible thru the dining room archway from the front of the dollhouse. When repairing/replacing mullions, I purposely created the kitchen mullions to be removable so that the customer can more easily arrange furniture and items in this back room now. Yet the mullions fit snuggly enough that it is not noticeable when viewing the house that they can be removed. With mullions securely in place. Check back tomorrow for more details and pictures of the finished project!